Muck Monsters of Massachusetts... maybe? Hi everyone! It seems like most of us have survived a crazy year. 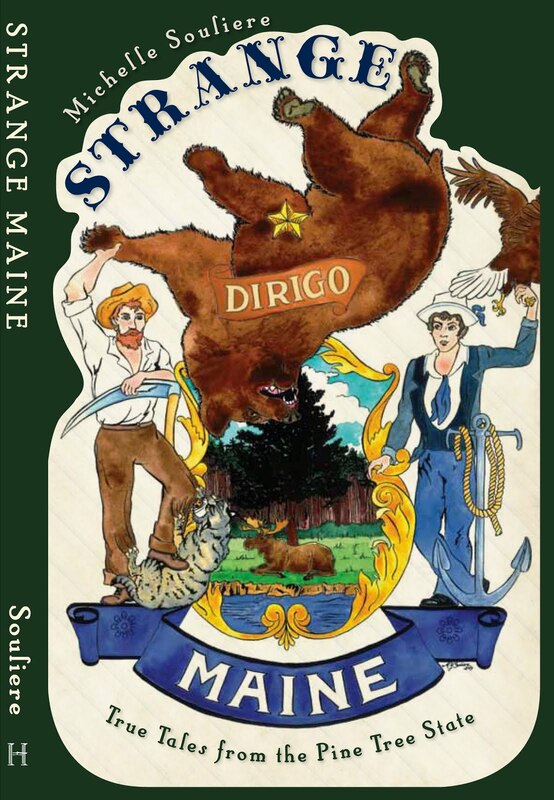 I am looking forward to some serious Strange Maine research in 2018, and I hope you can all look forward to seeing the fruits of that labor by the end of the year. As a personal update, late in the summer of 2017 I finally found my way free from the other job I was working alongside running my shop. I've spent the last few months getting settled back into running the Green Hand Bookshop full-time. It's been challenging, but a much-appreciated change of pace! January brings with it my reduced winter hours at the shop (closed Mon-Weds). My plan for January through April is to spend my time well, diving deep into one big project that is long overdue for finishing, and getting some more traction on a couple of new ones! I've already started chipping away at some of my files this month, and blearing my eyes with hours of microfilm searches. This, of course, means I stumble across some fun stuff that I can't help but take note of. While I'm still gathering material in preparation for bigger releases ahead, I did want to share this fun almost-a-monster story with those of you who love this kind of stuff the way I do! While this story is not specifically from Maine, it did appear in the Portland Press Herald, hailing from our old nearby alma mater, Massachusetts. 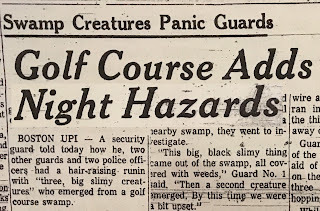 In 1971, there was a brief scare (dig those headlines in the clipping shown!) about "swamp creatures" on a local golf course. 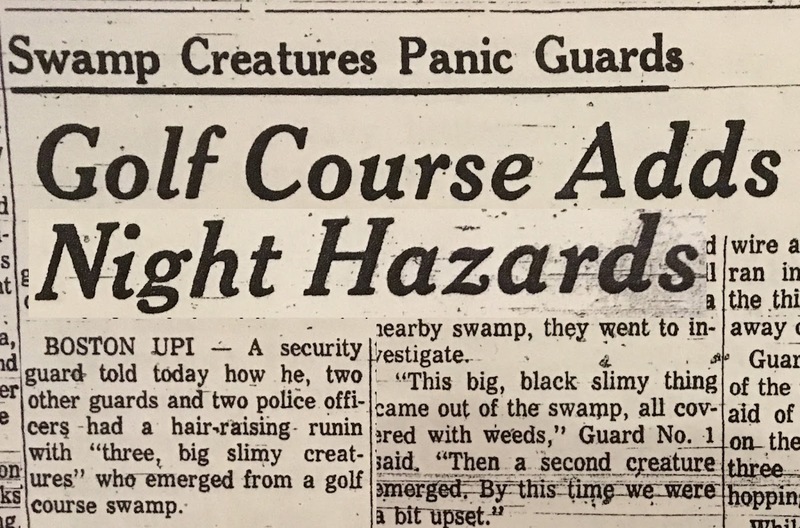 Boston UPI -- A security guard told today how he, two other guards and two police officers had a hair-raising run-in with "three, big slimy creatures" who emerged from a golf course swamp. The guard told his story over an all-night talk show on radio station WBZ in Boston, but declined to identify himself or tell where or when the incident occurred because of possible embarrassment to the participants. As it happened, he said, he and the two other guards were patrolling a golf course during the night when they stopped their golf cards atop a small hill. Hearing a splash from a nearby swamp, they went to investigate. "This big, black slimy thing came out of the swamp, all covered with weeds," Guard No. 1 said. "Then a second creature emerged. By this time we were a bit upset." He said that when a third "creature" walked out of the swamp, "We decided to beat a hasty retreat." Because it was dark and difficult to see, he said, one of the other guards ran into a guy wire and was knocked down, he ran into a water hazard, and the third guard managed to get away on a golf cart. Guard No. 1, after getting out of the water hazard, went to the aid of his companion who was on the ground. Meanwhile, the three creatures were "sort of hopping away." While this was taking place, the third guard had contacted two police officers and brought them to the scene. They immediately gave chase to the creatures. When one officer fired a warning shot, the creatures turned and waddled back toward them. The officers, understandably, also became upset. Guards No. 1 and No. 2, hurrying to see what was going on, ran through the darkness and bumped into the officers, knocking one down. The other officer dropped his revolver to the ground and put his hands up in the air. "Hey, pick up your gun," the excited guard said as the creatures approached. All turned out well, however, when it was determined the creatures really were three college students dressed in black scuba diving outfits, complete with feet flippers -- that's why they waddled. What were they doing in the swamp? Looking for misdirected golf balls so they could sell them. File it under EXTRA-CURRICULAR ACTIVITIES and stamp it "NOT RECOMMENDED!!!" Jeepers, guys, you almost got shot! This is a great example of how under certain circumstances our initial reaction to "mysterious things" can turn into a regular Three Stooges episode, even in such a mundane environment as a well-groomed suburban golf course. I have to say that the narrator's turns of phrase are particularly entertaining -- but I still would dearly love to read the police report that resulted from this!